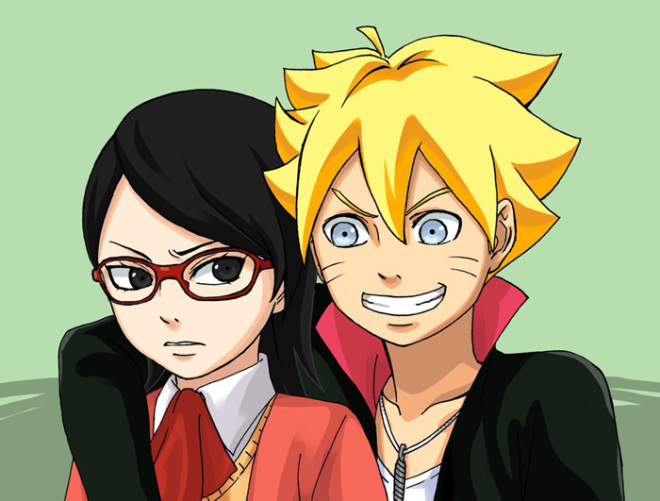 The Golden Week (April 27) will be shining brightly with a double issue of Naruto Manga “Naruto Gaiden” which is titled “The Seventh Hokage and the Scarlet Spring Month”. Shonen Jump is announcing in issue 18 which will be released today March 30th that Naruto will be returning for its follow-up Gaiden manga story titled “The Seventh Hokage and the Scarlet Spring Month” in the Golden week April 27th with a double 22/23 issue. New preview pictures show Naruto as the Hokage along with his and Hinata’s son Boruto and Sasuke and Sakura’s daughter Sarada Uchiha. It was mentioned that the manga will be short but we’re not sure “how short” it will be. These characters are going to appear in the anime feature Boruto: Naruto the Movie which will be released this August. my favorite male character ever, for now, I have to say is Akashi Seijūrō from Kuroko no Basuke. What I like the most is his overpowering cofidence and his emperor eye. He just exudes power and leadership. He doesn’t seem to be such a horrible person either. Just a rich kid who hasn’t know much other thing than power and winning. Even when he lost to Kuroko he wasn’t a jerk he was really just genuinely devastated like the other GoM. Today, the cover of the All New, All Different Avengers comic book was revealed. It reveals that Miles Morales AKA The Ultimate Spider-Man, the new female Thor, Ms. Marvel, and Nova will be joining the team along with Iron-Man, The Vision, and Captain America (Sam Wilson). 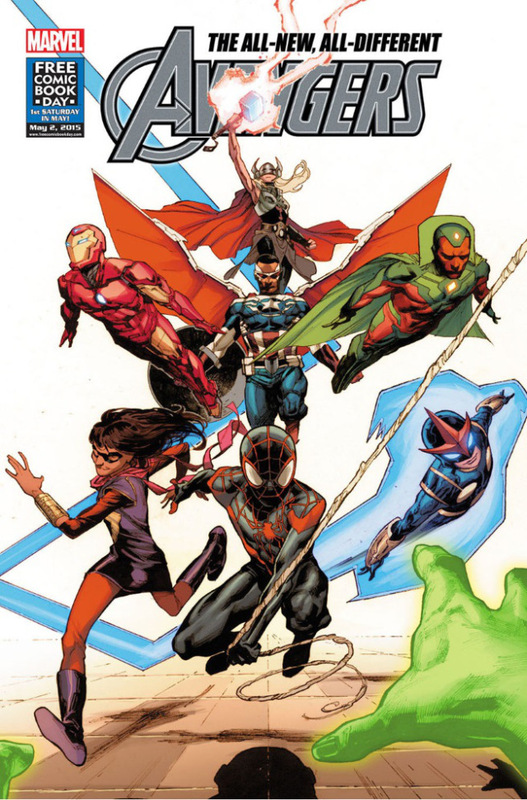 The All New, All Different Avengers will release on Free Comic Book Day, May 2nd. There are many animes I really really like. But when it comes to the one I feel like I could call my favourite anime I have a tie between Tokyo Ghoul and Fushigi Yûgi! Both plots, in my opinion are pretty interesting and with the characters and their respected roles they make great memories and stories. Sure Fushigi Yûgi is more concentrated on romance and Tokyo Ghoul seem more into the horror flesh eating. But still, I can’t choose between the two. Even if the song of Fushigi Yûgi is super catchy to me, Kanekis mask is super amaizing and with his white hair he’s so GAH!!! Amazingly evil looking ( I have a thing for white hair like that). So even then I can’t choose. okay so I’m doing a 30 day challenge! The first is the first anime I watch and it is Inuyasha( at least it’s what I have the earliest memory of). Inuyasha was really sweet when I was young. It was my first romance – before I didn’t like romance. I liked only action – it actually made me get into Shōjō. I had to say I was frustrated when the series ended at episode 167, but they then made final act which I didn’t watch ( I never felt the need) but I did read the last manga chapter. Nowadays I don’t class Inuyasha as my favourite, but it still earns major nostalgia points. Alright. So I’ll be starting a 30 day anime challenge just for fun. Thought I’ll be starting it tomorrow! I am a child at heart; seeing the world and movies and other things innocently. Apart from being a romantic and a dreamer this is something I will be forever. Yesterday night I realized this once again since my family and I watched The second How to Train your Dragon. And I gotta say, It was pretty amaizing. It’s been eons since I’d watched the first How to Train your Dragon so I can’t compare them with each other. But I can say that the second one gives a lot of backstory. They added two major characters which explain why the people of Berk didn’t like dragons ( I doubted that it was just because they stole livestock) Plus I’d been wondering why Hiccup didn’t have a mom. Usually in what I’ve watched the main character has to not have one parent, or be adopted, or their parents are both dead or they are some type of magical being or etc. And yet another story followed in these footsteps by bringing Hiccups mom back but killing his father in the process. Yes, it’s true that it was needed for Hiccup to become successor because he wouldn’t have taken over otherwise but that was a low blow. It hit the heartstrings; mostly after seeing the love between Stoick and Valka. Even worse, he was killed by Hiccups best friend. Oh the heartstrings, they burn! Of course, despite the painful moments Hiccup came up on top proving that friendship whoops mind controls but! Nakama power is strong in this one. And they all lived happily ever after! Tho it really deserves a watch. This movie makes me happy and hope it does the same you others. The last of us is a video game developed by Naughty Dog. It’s a action, adventure, survival horror game. Thought I wasn’t really scared much playing it. And just this week we completed it! It was an interesting play, with a good plot ( I love games with plot). It’s plot, focussed more on the way humans would act if there was a zombie apocalypse; in need for food, water, supplies, etc. so throughout the game Joel and Ellie, the main characters, ended up killing more humans than zombies ( runners and clickers as they call them in the game). The whole goal of the game was to bring Ellie to the Fireflies ( a type of militia rebel group) because she is imune to the virus. When I first started the game I knew that Joel would get attached to Ellie because she reminds him of his own daughter who dies in the beginning of the game. What’s interesting with their relationship is that they trust each other despite beings strangers ( you know what they say; danger has a way of bringing people together. Actually I don’t think that’s the saying but whatever.). Apart from the plot, the graphics are pretty darn amaizing. I’m not really a gamer, I only go for games with plot, so I don’t know much to say about games but when people play this game they’ll see how fun it is though. It’s like a movie that you star in as the main character. You make the decisions ( ish). Though unlike the real life you are able to redo some things. So Aquarions tenth anniversary is coming up and for this, they have decided to make yet another one! After Sōsei no Aquarion I believed there would be a better one that would reunite Sylvia and Apollo, Appolonius and Celiane after all this time! Alas, Aquarion Evol was released. I enjoyed the graphics and the music. I’m pretty sure I couldn’t get enough of Paradoxical ZOO for a month. But the story killed the first one, in my opinion. It was like Sōsei no Aquarion was just like the Old Testement in the bible. Too many things have changed even the apparent reincarnation of Appollonius has changed since Apollo was actually the reincarnation of a dog ( makes sense with the way he acted in the first one) but that means that Celiane really does not know who her lovers soul really is. It breaks my idealistic thought of love being eternal thought I do believe that no matter fate can be broken. Apart from that, I hated Amata. I liked his other half, Kagura, way better. Probably because he reminded me more of Apollo than Amata. But despite that fact, Amata still annoyed me. I thought he was weak, like a cry baby. He felt like a wall to me. The perfect blank page of nothingness. Mikono wasn’t good either. But I could forgive her because Kagura felt attraction to her. God I hated this moment. Anyways. I hope that this new Aquarion will create better main characters who are strong one way or another and have ups and downs ( real one) and aren’t self pitying ( a characteristic I hate in characters). Tho I have to say that the main girl Maia looks like a combo of Zessica and Mikono. I also feel kinda excited that there’s a kid that’s going to be there! She looks cute and feisty like Sylvia. Other than that I’m hoping for the aquari-gasms. I never get tired of those. Well guys. Get excited and hopes up! It begins in July! Check out the video for the trailer!